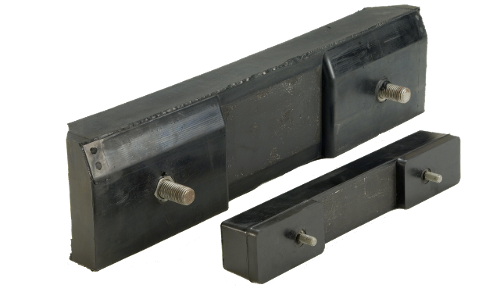 The poly bolt-on pad is easy to install and replace, reducing your labor costs. A reusable pre-drilled steel triple grouser bolts to the chain of the machine, while the polyurethane pad bolts to the grouser. An additive in the blue polyurethane makes the pad more abrasion resistant. 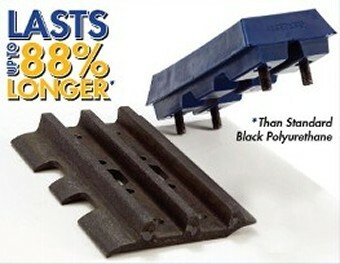 It’s proven to last 15 to 30% longer than the original black polyurethane. 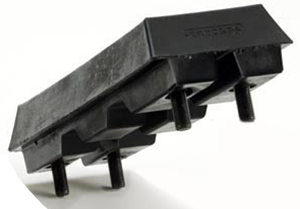 HIGHTOP Track Pads are thicker, more durable and longer lasting than traditional track pads. 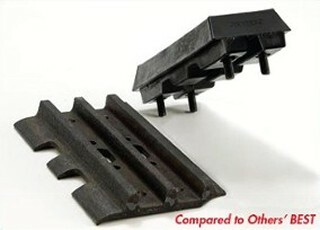 You will save a great deal of time and money relying on HIGHTOP Track Pads. 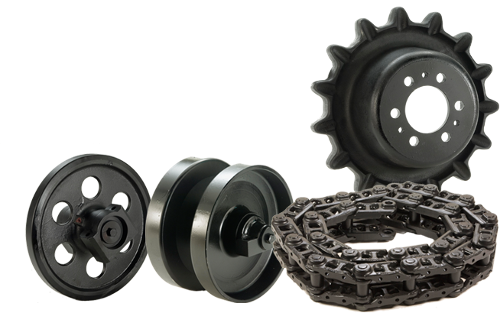 Get maximum life out your machine by ordering replacement chains, rollers, idlers, and sprockets. 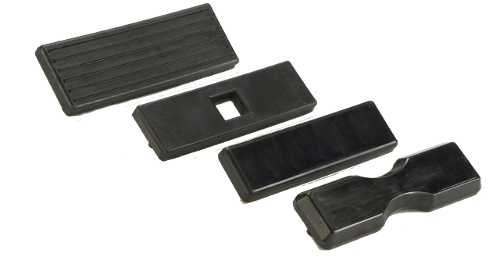 SAVING TIME AND MONEY, poly bolt-on and bonded track pads LAST LONGER than rubber pads while giving the TRACTION and PROTECTION you need. These HIGH-QUALITY tracks are backed by a ONE-YEAR WARRANTY and DESIGNED FOR EXTREME WEIGHT AND WEATHER CONDITIONS that occur on a paving site. 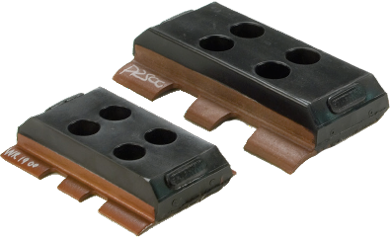 FOR GOMACO (Commander III, GT-3600, and GT-6300), these clip-on pads are quick to install and remove which SAVES YOU TIME and REDUCES LABOR COSTS. 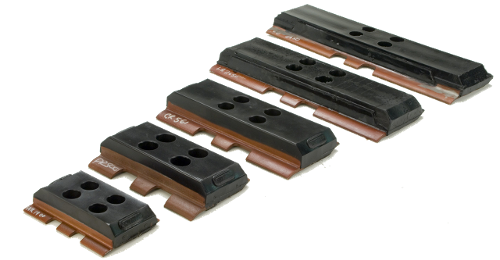 Provides TRACTION, surface PROTECTION and VERSATILITY you need. 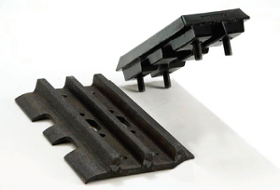 A COST-EFFECTIVE SOLUTION for traction and surface protection, these track pads are manufactured with HIGH-QUALITY RUBBER OR POLYURETHANE, giving them a LONGER LIFETIME. 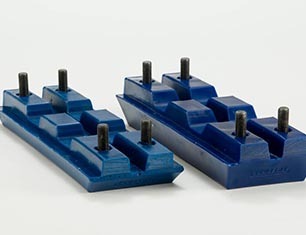 DURABLE pads BOLT RIGHT TO THE CHAIN and are READY TO SHIP for a variety of makes and models. 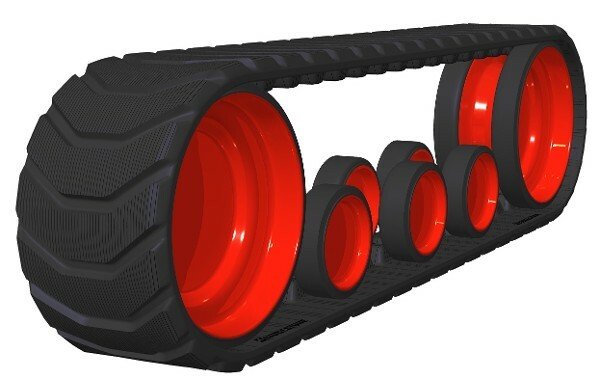 Made with compression and scratch resistant material, these HIGH-QUALITY tracks are backed by a ONE-YEAR WARRANTY and available for OVER 700 MODELS. Comes in Clip-On or Bolt-On; QUICK TO INSTALL and remove which SAVES YOU TIME and REDUCES LABOR COSTS . 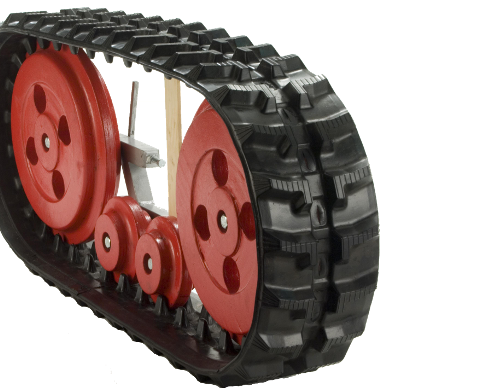 Brad Abbott, Equipment Manager for Golden Triangle Construction in Imperial, PA, bought a set of 600mm Clip-On ARTLINER-BLS RUBBER TRACK PADS for his Kobelco SK120. When he finally replaced the pads eight years later, he had racked up OVER 10,000 HOURS OF WORK on those pads, using two different machines.